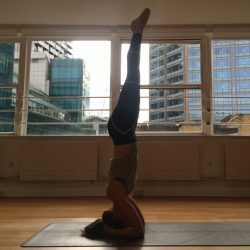 Want to learn headstand but think you’re not strong enough? Confused about how much weight should be on your head or worried you might fall? Always too tired by the end of class to give it a go? Come and learn the ‘King’ of all yoga poses in a safe and playful environment. We’ll begin by breaking the pose down into clear steps so we have a greater understanding of what’s involved. We’ll investigate which parts of the body we need to strengthen or stretch in order to develop the pose without even going upside down. Then when we’re comfortable, we’ll give it a go! Whether we get there or not in this workshop, you’ll leave with all the tools and knowledge you need to practice and master this incredible pose. Numbers will be limited to ensure that everyone has enough time and attention. Book now!